The 10 Best Live Music Venues in Iowa! Nothing beats a night out listening to good music, especially if the venue you are visiting is a fun place to be. 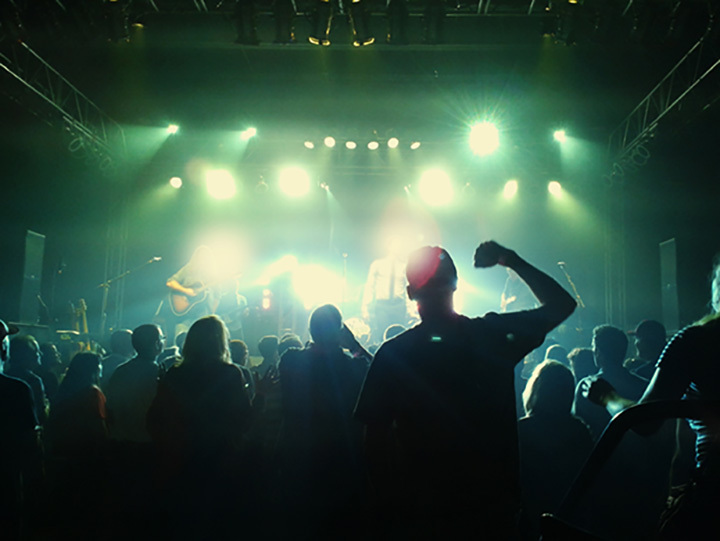 Whether your musical tastes revolve around country, rock, alternative or classic, the state of Iowa has plenty of music venues to choose from, and many not only deliver the sound you're seeking for, but a select number also serve up the right ambiance to make your night one to remember. For the right place to catch a great show, be sure to check out these 10 best music venues in the state of Iowa. The Codfish Hollow is a unique destination in rural Iowa that attracts local and national indie bands in an old, converted barn. It’s not just the variety of soon-to-be-favorite and already established bands that makes Codfish Hollow so great, but it’s the well-planned atmosphere and overall fun party that it provides that gives Codfish Hollow its fame. Always appropriate for all ages, your visit to Codfish Hollow begins with a hayride to the stage and is followed by an amazing music experience. Located in the historic Sherman Hills neighborhood of Downtown Des Moines, Hoyt Sherman Place was erected in 1877 by Hoyt Sherman himself, and over the years and coinciding renovations has blossomed into one of the most eloquent and amazing music venues in Des Moines. Featuring top musical acts and a whole host of art, dance and talk performances, the Hoyt Sherman Place Theater hosts an experience in of itself through the amazing architecture and ambiance of within this historic spot in Des Moines. The Redstone Room in Davenport, located on the second floor and part of the non-profit River Music Experience (RME), is a 270-person capacity music venue with a full bar available and tons of notable and new music performances. Equipped with the latest audio and visual gear, the Redstone Room provides an intimate concert experience no matter the first-come, first-served seating you manage to grab, and best of all, all proceeds from the concert go towards RME’s Children’s Music Education Classes. For a quintessential Iowa City music venue, be sure to check out of the shows and performances The Mill hosts nearly every day of the week. Whether it’s the open mic night to showcase your talents, or you want to catch a variety of touring acts, The Mill provides an enclosed and cozy experience to watch people perform their passions, and if you’re hungry or thirsty while you’re doing that, The Mill has you covered with a full menu and wide array of beverage options. DG’s Taphouse, the self-reported premier rock club of Ames, has everything you need for a fun weekend out. Alongside the technically savvy sound system and ample dance floor found around the stage that’s in use four nights of the week, DG’s Taphouse also has a full selection of Iowa and other domestic craft beers and ciders, well-maintained darts and billiards stations and daily food and drink specials for you to enjoy. As a cultural hub in the Downtown Des Moines music scene, the Vaudeville Mews stands proudly as a premier music venue hosting local, regional and national acts. Featuring a full stage and an intimate, standing room only viewing experience, you feel like part of the Des Moines community when watching a show at the Vaudeville Mews, making for an engaging experience every time a band steps onto the stage (which happens at least four times a week). Connected to the Diamond Jo Casino in Dubuque, even if you don’t consider yourself a gambler, you can bet you’ll have a good time at the Mississippi Moon Bar. Stacked with state-of-the-art sound and lighting systems, and a wide variety of musical and entertaining performances, including comedy venues and dueling piano parties, see for yourself why the Mississippi Moon Bar adds more excitement to the Diamond Jo Casino in Dubuque. Featuring all sorts of music and live performances ranging from jazz bands to spoken word, it’s not just the names on the historic marquee outside that attracts patrons to the Englert Theatre, but it’s also the history and ambiance of this historic structure that draws a crowd. Preserved to be the last remaining historic theatre in Iowa City, alongside the necessary modern renovations, the Englert Theatre shines as a special music venue in downtown Iowa City that welcomes you to be a part of its history. Listed on the National Register of Historic Places, the Paramount Theatre was first constructed as a movie palace in the 1920s, and has since been renovated to be a premier music venue in the state of Iowa and home to one of the region’s top-ranking symphony orchestras, Orchestra Iowa. Whether you’re looking for Broadway or orchestral performance, comedy or children’s shows, and especially live music in an historic venue, then the Paramount Theatre will live up to all your expectations of a great night out. While there are a lot of outdoor concert options to be found in Iowa throughout the summer, something about the Bandstand in Oskaloosa City Park makes it notable above the rest. Perhaps it’s just the musical talents of the Municipal Band that plays every Thursday evening throughout the summer, but more likely it’s the relaxing atmosphere of this centrally located music venue, plus over 150 years of historical significance built into the bandstand that gives this outdoor music venue it’s extra charm. View more Iowa Live Music Venues.